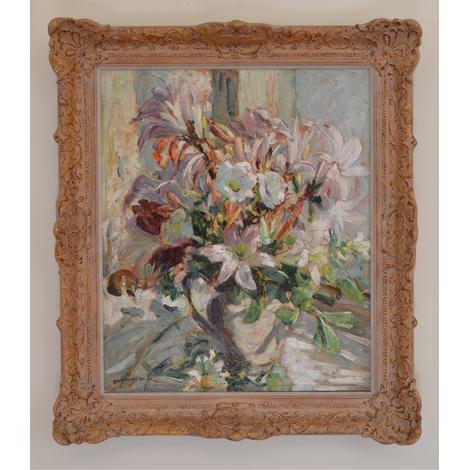 Dorothea Sharp's best flower paintings are, surely, the culmination of her life's work. In her later years - when she was, perhaps, finding it more difficult to walk through sand and climb hills - she set herself the challenge of exploring effects of light with a bowl of flowers on her window-sill. The light creates silhouettes, dissolves and highlights the forms, radiates and shines from the window, from the embrasure and the jug which sits within it, from the matt and glossy flower petals. This miracle of contre-jour, this marvel of colour, light and paint, is one of the best floral pieces we have seen. 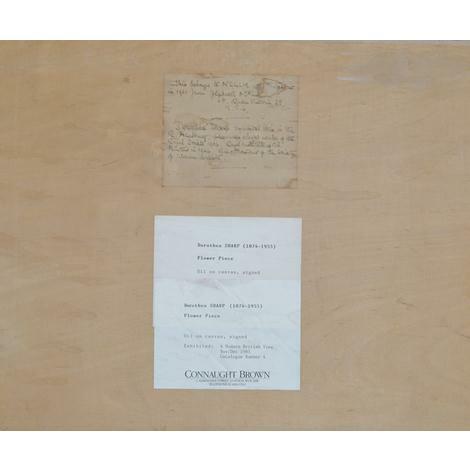 It was exhibited at the Royal Academy (see verso) and was probably Lilies in the Window, shown in 1946.